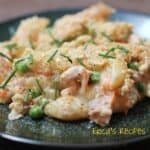 Cheesy, comforting, Salmon Casserole. Kids love the shell-shaped pasta. I love the fresh salmon. This recipe is easy for a weeknight, and even the leftovers are SO GOOD. 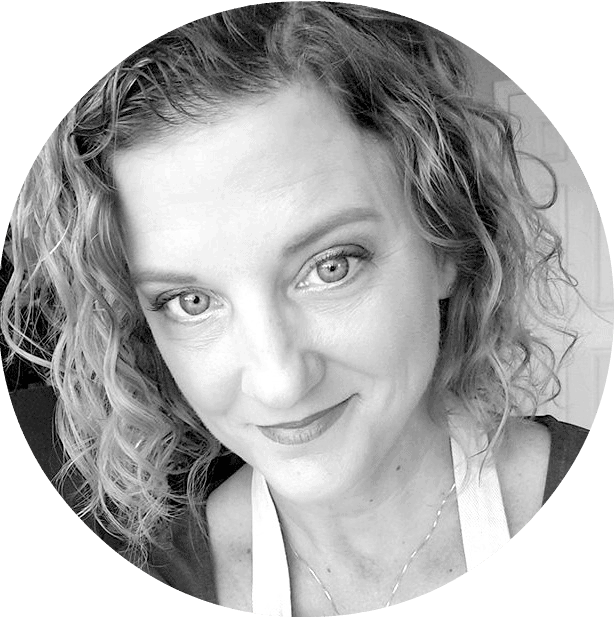 There are those times when I go totally gourmet – cooking something just for the sake of wanting it to be literally and tastefully beautiful. There are those times when I cook just for the health of my family. 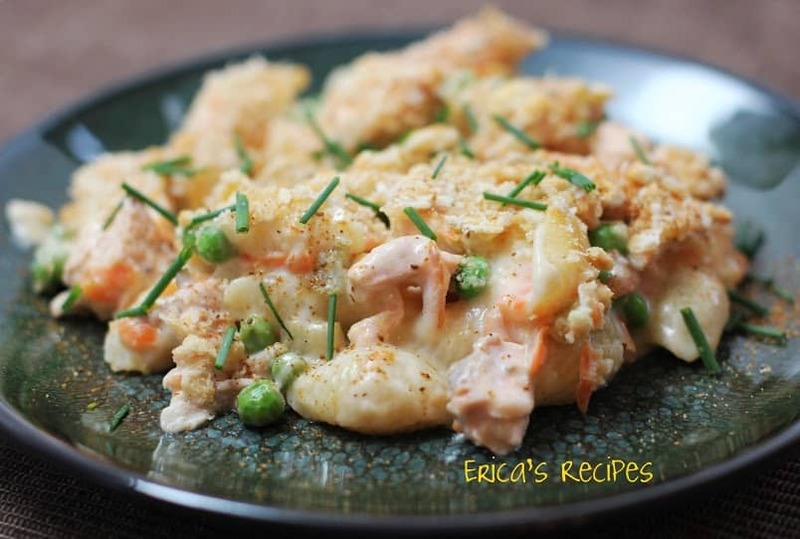 And there are those times when I just want a cheesy yummy seafood casserole. 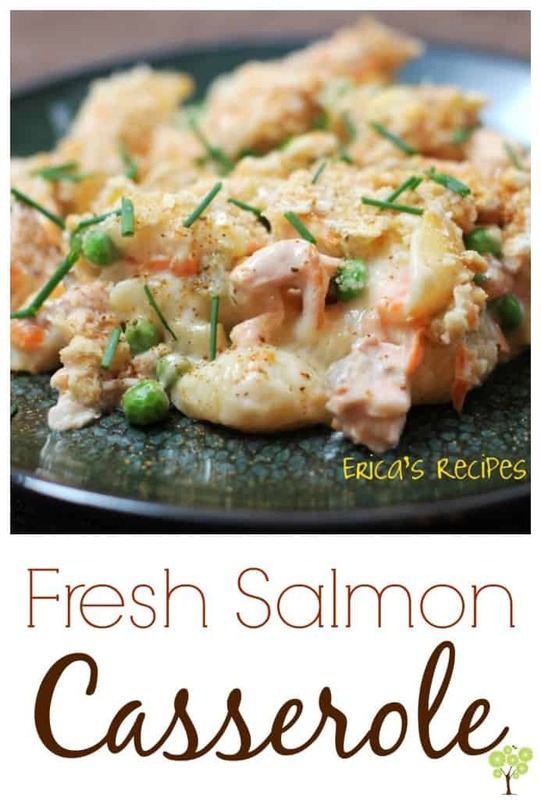 Unlike Tuna Casserole, which I make with canned tuna, I really prefer fresh salmon for this casserole. And I cook salmon every week for my lunches anyway, so it’s no effort to tack on an extra half pound at the grocery store. 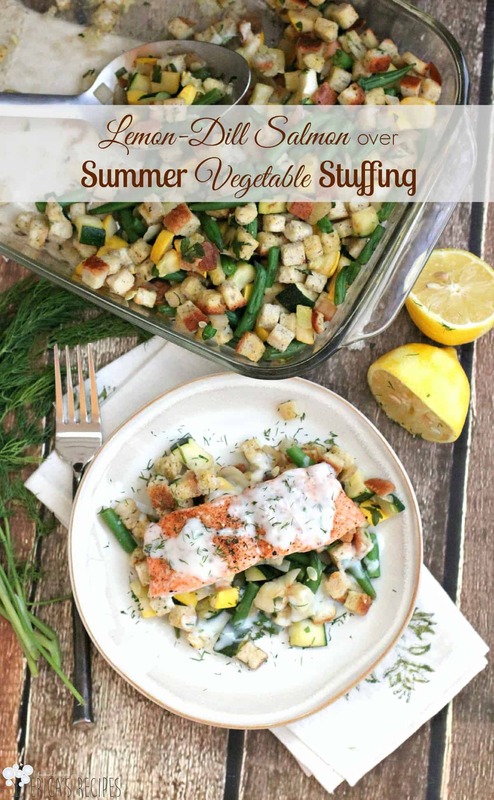 A night or two before I plan on making this Salmon Casserole for my family, I’ll take the fish, throw it on a small baking sheet, season with kosher salt, pepper, and Old Bay (of course), and bake at 400F for ~15min. And I line the baking sheet with foil, so there isn’t even any cleanup! 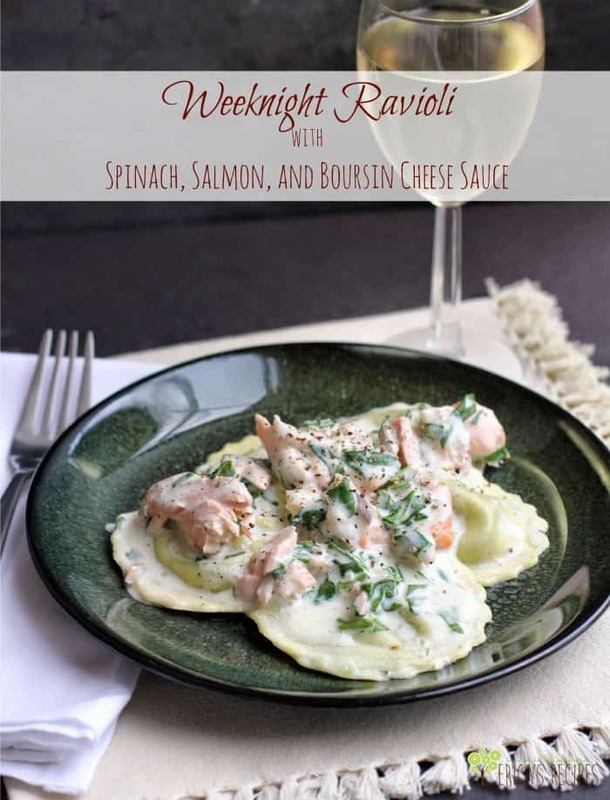 This recipe is really good and feeds the four of us (2 adults and 2 kids) for 2 nights. Bring a pot of water to a rolling boil. Add a fistful of salt. Add the pasta shells and cook according to the package directions just to al dente. Half way through that cook time, add the shredded carrots to the pot of water to cook as well. Meanwhile, in a large bowl combine the soup, mayo, milk, cheese, peas, salmon, and onion. Drain the pasta and carrots, and add right away to the soup mixture. Toss and pour in a 2-qt baking dish. Top with the crushed crackers. Bake 30-40 minutes until nice and bubbly. Optional: dust with a little Old Bay and sprinkle some snipped chives for garnish. Serves 6. 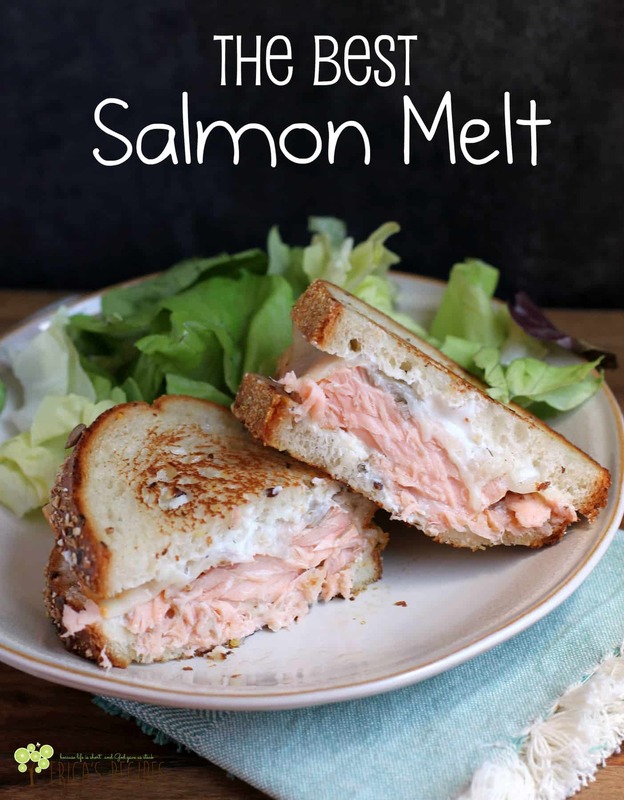 Sue loves salmon, so I will probably be tasting this soon.